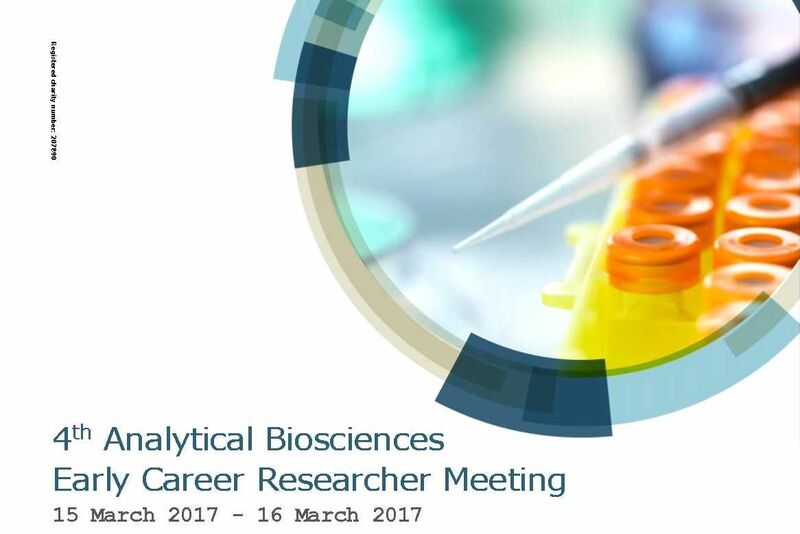 Welcome to the Royal Society of Chemistry Analytical Biosciences Group Early Career Researcher Meeting (ECRM2017) at the University of Warwick. We hope you will engage in discussions and debate through considering applications of the current and future analytical technologies. Plenary speakers will begin each session with an exciting founding perspective and vision of a technique, which will be followed by peer-reviewed papers to provide the current research and analytical applications. We hope delegates will obtain a broad overview of the current state of the art for analytical techniques, with detailed examples of their applications. It is intended to highlight and demonstrate the breadth and depth of these techniques to encourage their translation into new areas. With this aim in mind, each contribution will aim to demonstrate the quality and value of each methodology. The Royal Society of Chemistry Analytical Biosciences Group is hosting a meeting (at the University of Warwick), to present both current best practices and future development opportunities for analytical techniques in the biosciences. The meeting is deliberately broad to present an opportunity for researchers to expand the breadth of knowledge into the broader subject whilst presenting the detail of their own ongoing research, with the added challenge of taking their research outside of it’s current topic. In practice, these essential and widely-applied techniques rapidly tend to become technically detailed, and thus out of reach for translation into other areas of application where they may offer new insights. This meeting targets the early researcher sector, to engage them in a two-day event to consider and present the translational and wider applications of current and future analytical technologies. Plenary speakers will begin each session with an exciting founding perspective and vision of a technique, which will be followed by peer-reviewed papers to provide the current research and analytical applications. Delegates will obtain a broad overview of the current state of the art for analytical techniques, with detailed examples of their applications. It is intended to highlight and demonstrate the breadth and depth of these techniques to encourage their translation into new areas. With this aim in mind, each paper will aim to demonstrate the quality and value of each methodology. Papers are invited for oral or poster presentation from early career researchers in the biosciences who apply any analytical technique as a significant part of their work. This certainly includes, for example, chromatography, diagnostics and biophysics in addition to the topics of the sessions. There will be a best poster award for the poster that provides the most engaging example of analytical bioscience, whilst conveying the technique’s relevance and potential for application in other disciplines (as judged by the members of the ABG committee). Conference dinner is going to take place in the Woodland Grange in Leamington Spa. Transport to and from the venue will be provided. Registration is £150.00 and includes the conference dinner, £120.00 for RSC members, and £90.00 for postgraduate students. Early Bird registration until 31st January 2017 - £130 full fee; £100 for RSC members and £70 for postgraduate students. The Analytical Biosciences Group invites the early career delegates to make use of our bursary programme to help cover the costs of attending this event available here. Corporate exhibitor space is available; please enquire with the local organisers for details.